The 18-Volt LXT Lithium-Ion LED. Flashlight (model DML808) provides bright illumination, versatility, and convenience. The high-luminance single LED. Flashlight provides a full 200-Lumen of light and a sharp, round spotlight. Features include a beam adjustment from spot to flood, and a 12-position pivoting head with positive stops from 60 to 110. When used with a fast-charging 18-Volt LXT Lithium-Ion 5.0Ah battery (sold separately), the flashlight delivers up to 23 hours of continuous illumination on a single charge. The Flashlight can be powered by Makita 18-Volt LXT and 18-Volt LXT Compact Lithium-Ion batteries. Added features include aluminum flashlight head for increased durability and a metal hang-hook. The flashlight has a slim, compact design at 11-3/4L and weighs only 2.5 lbs. 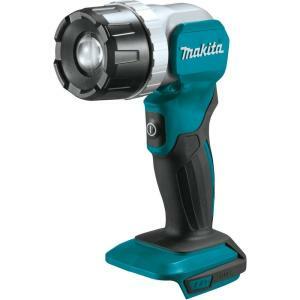 (with 18-Volt LXT battery, sold separately), its part of Makita expanding 18-Volt Lithium-Ion system, the worlds largest cordless tool system powered by 18-Volt Lithium-Ion slide-style batteries. Makita 18-Volt Lithium-Ion batteries have the fastest charge times in their categories, so they spend more time working and less time sitting on the charger. Tbook.com crawls the web to find the best prices and availability on Flashlights and related Tools and Hardware products like Makita 18-Volt LXT Lithium-Ion Cordless Adjustable Beam LED Flashlight Flashlight Only. For this page, related items include products we find that match the following keywords: "Flashlight" at our vendor partner Home Depot. Makita 18-Volt LXT Lithium-Ion Cordless Adjustable Beam LED Flashlight Flashlight Only is one of 152 Flashlights and related products listed in the Tools and Hardware section of Tbook.com If you have any questions on this product, please give us a call at 734-971-1210 during the hours of 9am - 5pm EST for assistance. Thank you for shopping at Tbook.com, the Internet Department Store!